Teachers in the Los Angeles Unified School District (America's largest district) are walking the picket line this week in the pouring rain, demanding an end to the billionaire dark-money backed privatization movement that funnels public education funds to the shareholders of racially segregated, underperforming charter schools. 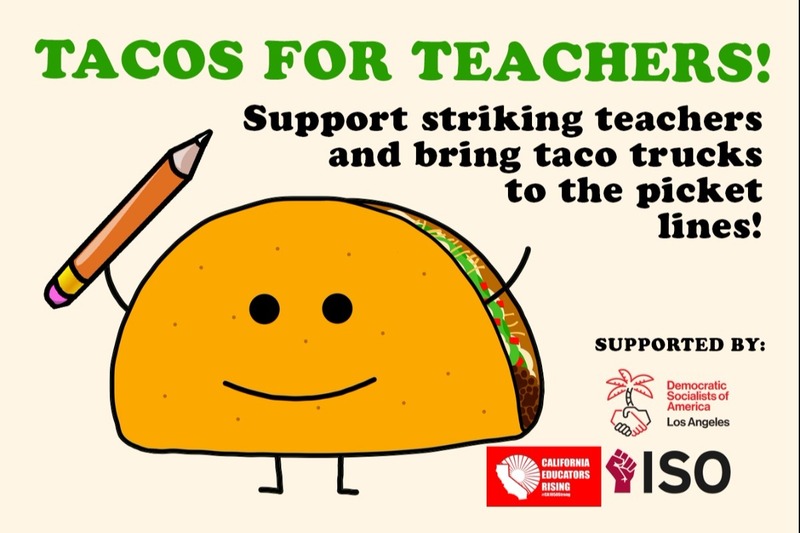 The Democratic Socialists of America have started a GoFundMe to provide taco truck meals to the striking teachers. It was originally intended to raise $1,000 and feed a couple schools' worth of teachers, but it's reached $24,000 as of this writing. I just sent them $100. I am a dues-paying member of the Democratic Socialists of America, having been inspired to join by Alexandria Ocasio-Cortez.